New iPhone screen sizes in development? 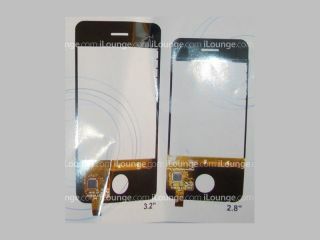 New screens, but are they iPhone? Apple iPhones could be getting a size makeover if photos from a Taiwanese company are to be believed. Host Optical have unleashed pictures of iPhone-alike screen casings in 3.2” and 2.8” sizes, smaller than the current 3.5” Apple behemoth the world is salivating over. The designs are unlikely to figure on the new and updated 3G model, expected Monday 9 June, as this is probably going to look largely similar to the current iteration. Host Optical is saying it has developed a screen that can withstand the effects of touch-screen aging, where the surface becomes less responsive over time, a problem for the modern iPhone generation. The new screens use capacitance to drive the touch, and are more stable and able to withstand water and humidity, helping to prolong the life. There could be nothing in this at all, as Apple is company that wouldn’t appreciate this kind of attention for unreleased items. They could be for nothing more than cheap iPhone clones that are doing the usual rounds in Asia, as the two sensor/camera holes next to the earpiece are unlike any current iPhone/iPod. But why release improved touch-screens in a cheap knock off? Could this be for a rival company that plans to unleash its own iPhone killer perhaps?